Hmmm...............methinks Discovery Channel on TV has to remove an awful lot of "documentaries" that are pushing this Carbon Lie! He says "..follow the cite and you end up with a blog post by a lawyer who has nothing of scientific interest to say about radiation physics." So you might want to add these links to your article. Besides the above reply, I see a few major issues with the paper's conclusions based on the cited references. The first is the use of the GISS temperature data set. It would appear that Hansen in his fervor to cool the past and warm the future has adjusted himself into a perfectly natural warming process. Maybe this paper will be what it takes to get him to change the data set to something more realistic. The second issue is the CO2 emissions data which are most likely just a bit above pure guesswork. The data are estimates, at best. The natural sinks and sources likely have more variability than the rate of increase in CO2 concentrations. I am afraid this paper is doomed mainly due to the data sets the AGW folks have used to prove their case. You just can't win. So let me get this straight ... You're saying that the data sets that the warmists use to prove global warming are so contaminated that when they are used to show that CO2 lags the warming that dooms the analysis? So doesn't that also mean that it dooms the claims of the warmists? Of the ~97% natural origin CO2, the vast majority comes from undersea vents, by a curious path. High heat, high pressure gas is discharged into 150 atmospheres and 2C water, forming liquid CO2 almost instantly. This forms "vast pools of liquid CO2 on the ocean floor" per "Volcanic CO2" by Timothy Casey, posted at geology-1011.net. This reservoir keeps the ocean at maximum CO2 gas saturation at all times. When the ocean warms, it releases this stored gas. This warming is NOT from subduction of surface warmth, but upwelling of varialble geothermal energy. This is explained in "Earth's Missing Geothermal Flux". Carbon Climate Forcing has always been about FORCED Carbon Commodity trading....by traitors to Truth. Climatology is the credit default swap insurance for this global fraud. We all know that the oceans can release heat to the atmosphere, (the El Nino - La Nina cycle demonstrate that) so I guess if the atmosphere can't heat the ocean, I should be able to put a beaker of water in a warm, dark cupboard and it'll eventually freeze. Put an open beaker of water in a warm, dark cupboard and it will also equilibrate to cupboard temperature via conduction and will also evaporate. You'll find the rate of evaporation very low compared to the rate of heat transfer, and whether the heat transfer is via radiation or conduction is less important than the fact that there is heat transfer, oh, and if the argument is that if the water is warmer than the air it's in contact with the heat transfer is going to be from the water to the air, well, heat energy is moving in both directions, so the temperature difference affects the net rate of heat transfer. Obviously the effect on the temperature of the atmosphere from a reduction in the net rate of energy flow from the oceans to the atmosphere is going to be far greater than the effect on the temperature of the oceans, that's not a point in contention. "heat rises" isn't evidence that net energy transfer through conduction from sea to air won't be slowed if the air is warmer. Wind ensures that the near surface air isn't significantly stratified in terms of temperature (reminds me of the claim that because CO2 is heavier than O2 or N2, all the CO2 is near the ground, when it's actually well mixed through the whole troposphere and stratosphere). Nothing there refutes the claim that rising CO2 is a result of burning fossil fuels. The ROOM that the beaker was in will be above freezing therefore the beaker that is sitting in it will not freeze. The ocean waters is continually getting influx of energy from the sun thus the flow continues into the atmosphere unabated thus it is not possible for it to freeze over. Evaporation is slower than IR because one move at the speed of light and the other does not. Andrew W: There is very little reduction in energy flow from the oceans to atmosphere due to a warming of the atmosphere. The atmosphere cannot heat the oceans due to the immense differences in heat capacity, and the other reasons linked in the post above. "Nothing there refutes the claim that rising CO2 is a result of burning fossil fuels." You can't even verify that the alledged BACKGROUND CO2 level measured at the official stations is a meaningful metric the way they are selected and normalized!!! For instance, at Mona Loa they can throw out 2/3 of the data for a month because it exceeds their standards in some way. We do NOT have a believeable metric to compare things to. The paleo record is probably a better record than our high tech measurements. The alarmists are increasingly being shown to be "All tip and no iceberg". Okay, so can we petition the Australian Government to get rid of the Carbon Tax then??? I wish the conclusions of this paper were correct, but unfortunately they are not. This paper makes a fundamental mathematical error, and hence the conclusions are not supported by the method used (and indeed easily shown to be incorrect). No correllation, no matter how strong, with the annual increase in atmospheric CO2 can explain the linear component of the long term rising trend in CO2. This is because the linear component of the long term trend corresponds to the mean value of the annual increase. The correllation is mathematically independent of the mean value (if you look at the mathematical formula for a correlation, wherever the observations appear in the equation they have their mean value subtracted). Thus the correlation explains the variability of the annual increase around its mean value, but not the mean value itself and it is the mean value that is responsible for the long term trend. This is a mistake that has been made before, and I expect it will be made again, but it is a shame for all concerned that this one has slipped through peer review. The effect of sea surface temperatures on the annual increase in CO2 is well known, and has been for 30+ years (Bacastow 1976) and is described in the IPCC reports. The analysis of this in the paper is essentially correct, but entirely uncontraversial. The suggestion however that anthropogenic emissions has little effect on atmospheric CO2 is howerver incorrect (as multiple lines of evidence suggets) and the conclusion relflects the authors error in not considering the effect of anthrpogenic emissions on the mean value of the annual increase, which is not measured by te correlation coefficient, and is what actually causes the long term trend. Skeptical science has no credibility! I agree, I have posted there several times only to have my inconvenient posts erased. Well, I didn't find Bart's reasoning very persuasive. An analogy to his argument would be; If a lake with a narrow outflow had a given average height for many decades, and an engineering project were constructed that diverted additional water flow into the lake, and when this happened the lake level rose, that is not evidence that the additional inflow caused the rise in lake level - Even if no other changes had been detected that could explain the rise in the lake level. All sounds like rationalizing to justify a political or ideological agenda. If a city has a major particulate air pollution problem, and as the problem grows so does the incidence of respiratory illness amongst the inhabitants, that's no evidence that the two are linked, even if there are high levels of particulates in the respiratory systems of those suffering most from the illness. If germs are seen at the sight of an inflammation, and the same germ is seen in multiple cases of similar inflammations,that's not evidence that the two are related. After all, Germ Theory is only a theory. Given the atmospheric CO2 correlation with El Nino, and the peer reviewed papers offering explanations, I struggle to see merit in this offering from Humlum et al. Your examples are post hoc ergo propter hoc, one of the most basic of logical fallacies. Rates of malaria are increasing, and people have their windows open at night. Ergo it's the nightly bad air that causes it. People with high stress tend to get ulcers, hence it's the stress that causes it. Both very obvious, yes? And, both entirely wrong. The correlation between temperature anomaly and the rate of change of atmospheric CO2 is very tight. It's all you need to project atmospheric CO2 to a very high level of fidelity: the starting point, and the temperature record. Human inputs are essentially superfluous. The only way you could get human inputs to have significant influence would be to posit a very exotic natural filtering process which removed the low frequency portions of the temperature response, and substituted in the anthropogenic forcing in its place. But, that sort of operation would leave very visible phase distortion in the temperature-to-CO2 relationship. There is no such observable phase distortion. Ergo, this appeal to complexity fails. Occam's razor comes down very clearly on the side that atmospheric CO2 is essentially governed by a natural, temperature dependent process, and human inputs do not have a significant impact. Hi HS. I got a link to this article, and thought it was fresh. Should have looked at the dates. Sorry to bother. No need to publish these comments. interesting article and arguements. One forgets the article, to follow the arguements. But are we flat-earthers. All the ocean gets sunlight all the time, and does the local star extinguish at night, or does the earth revolve as a ball, around a local gravity pit. There are innumerable valuatiions that are asscribed to the the earth, and this article did do some justice, by adding more to the equation. Yes he did use bad datasets, but those are the datasets that are being argued as so bad for mankind. That our uneducated forefathers could not add up two plus two. But they created the educational system that told us how to add the numbers, and slapped our hands with ruler until we got it right. Now they are acknowledging that volcanoes and other influences are part of the problem, they just have to enumerate them. But we are still stuck with the same datasets, and the same dataset master who corrupted the first dataset, and that we have to trust them to look out for mankind. Why? "In an effort to determine the likelihood of this concern, Knorr constructed a new-and-improved history of AF values stretching all the way back to 1850 by utilizing data on CO2 emissions arising from fossil-fuel use, cement production and changes in land use, as well as atmospheric CO2 concentrations measured at Mauna Loa and the South Pole, plus those derived from Law Dome and Siple ice-core data, together with their associated uncertainties. Based upon that reconstruction, the UK researcher reports that "despite the predictions of coupled climate-carbon cycle models, no trend in the airborne fraction can be found [italics added]." Or as he writes in the concluding section of his study, "the hypothesis of a recent or secular trend in the AF cannot be supported on the basis of the available data and its accuracy," which indicates that not only has the global ocean been increasing its uptake rate of anthropogenic carbon in such a way as to successfully "keep up" with the rate at which the air's CO2 content has risen in response to historical anthropogenic carbon inputs - as has concurrently been demonstrated by Khatiwala et al. (2009) - so also have Earth's terrestrial ecosystems been "keeping up" in this regard." From the link above:"Noting that about 40% of the yearly amount of CO2 that is released to the air by human activities has historically remained in the atmosphere - a quantity that has come to be known as the airborne fraction of anthropogenic CO2 (AF) - Knorr (2009) states that several studies have recently highlighted the possibility that the world's oceans and terrestrial ecosystems may be gradually losing their ability to sequester such a large proportion of humanity's CO2 emissions, citing the work of Le Quere et al. (2007), Schuster and Watson (2007) and Canadell et al. (2007). And the author states that if this possibility actually materializes, "in a way predicted by models, this could add another 500 ppm of CO2 to the atmosphere by 2100," which would greatly exacerbate the so-called "climate crisis" envisioned by Al Gore and the Intergovernmental Panel on Climate Change." If anything the implication is that anthropogenic CO2 is recognized as contributing to the observed increase in atmospheric CO2. The paper is simply arguing that the present sinks are likely to continue taking CO2 out of the atmosphere at their present rate because they're not demonstrating CO2 saturation. Which is something I think is likely. If there is so much wrong with this paper how did it get past peer review - or does that not signify anything these days? You mean like Mann et al '99, published in Nature? What specifically do you claim is wrong with this paper? Vague comments with no scientific backup are not helpful. The flaws with this paper are summarised in two comments. Masters & Benestad show that Humlum's approach misdiagnoses causes. Richardson shows that the conclusion violates conservation of mass, and that if you follow the maths and run the numbers so that the approach is consistent with maths, then you can calculate the natural contribution and the human contribution to rising atmospheric CO2. The links aren't operational and produce a "Request entity is too large" error. Do you have links to the full comments? Humlum should be given the opportunity to reply. I will email him for a reply. No, we were not informed by the journal that any of these papers were coming, and did therefore not have the opportunity of writing a reply, as would usually be the case. like what is seen on longer time scales in ice cores), but that this does not exclude that there might be an intermediate time interval where the opposite may be true (temperature follows CO2). changes of CO2 (quite essential for the CO2 hypothesis). But this is obviously not the case. MS, Humlum was emailed an early draft of the Richardson (2013) comment on September 15th, 2012. MS, I'd also add that the Richardson reply shows that rises in CO2 correlate at a time lag of zero (or +1 month, +2 months, whatever) with man-made CO2 emissions. Which is what you'd expect if man-made CO2 was going into the atmosphere and not magically turning into pixie dust or being teleported into space. The reason that Humlum et al reached the opposite conclusion, was that they compared the change in atmospheric emissions with the change in the change of human contribution. Analogy: Richardson compares distance travelled with speed, whereas Humlum compares distance travelled with acceleration. This seems a bizarre choice as there is no obvious physical reason why these should be well correlated, and Humlum et al don't provide a reason in their paper. 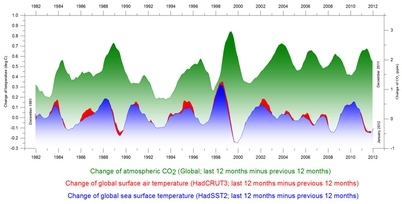 Well, if that's what Richardson et al says, it is contradicted by the findings of Francey et al [linked above] and by the graph of CO2 & temperature over time. I have emailed Dr. Humlum for a reply. I believe that we just have to accept and respect that people may disagree on the interpretation of certain data sets. entire staircase this group of muscles presumably is important as well. But we do not prove it, I agree. But then, it is virtually important to prove anything in science, only to make different interpretations look more or less likely. I find Ole's interpretation unbelievable, I don't think he's had time to properly read the Richardson comment. Humlum et al differentiate the human emissions rate. The human emission data data he takes are in Gt per year, and he differentiates them into Gt per year-squared. i.e. quantity per time-squared, which is an acceleration. They then take the atmospheric quantity of CO2 in ppm, and differentiate that to get a value in ppm per year. i.e. quantity per time, which is a velocity. They then correlate those two, but do not explain why they correlate a velocity with an acceleration. If you are consistent and correlation human emissions in ppm per year with the atmospheric change in ppm per year, then you find there is a correlation. The Richardson approach is based on starting with conservation of mass and then following the equations to ensure physical and mathematical consistency. Humlum has not demonstrated the physical and mathematical consistency of his approach yet. I find error in the multiple comments stating that the atmosphere cannot warm the ocean because LWIR can only penetrate a few millimetres or because heat cannot transfer in due to the sea-surface microlayer effect. In short, both arguments essentially state that heating the surface causes increased evaporation that then leads to an energy release that causes the surface temperature to cool or remain stable. Greenhouse gases have played a role in the Earth's temperature and always will. They do so by trapping longwave radiation and warming. The net increase in heat content in the atmosphere is then transferred via radiative or physical means warming the systems both above and below. The system isn't stable, there is mixing going on, and so the net heat doesn't stay at the microlayer on the ocean surface, it mixes, being transferred deeper into the ocean in many locations including where water masses downwell. This transfer takes time. The net ocean temperature is slow to change but it does change. This lag in temperature change causes several other feedback's including out-gassing of CO2 that may lag behind the shift in temperature. Yes, it's possible to have anthropogenic forcing disturb the equilibrium, heat the atmosphere which then warms the ocean causing a lagged release of more CO2. That's caused positive feedback. Anthropogenic forcing, be it from changes in ecosystems, greenhouse gas emissions, or other means, is part of the net heat balance on the Earth. I'm not saying we should run for the hills because we are destroying the planet, but let's not fool ourselves by letting a poor understanding of basic physics lead us into thinking that we humans don't have an influence on our planet. and because of convection [heat rises]. The ocean has 1000X higher heat capacity than the atmosphere, therefore the oceans wag the tail, the atmosphere, NOT the other way around. dCO2/dt correlates with LT temperature dn CO2 lags LT temperature by ~9 months. Here is a post from 2009. After publishing this paper, I also demonstrated the same correlation with different datasets - using Mauna Loa CO2 and Hadcrut3 ST going back to 1958. More recently I examined the close correlation of LT measurements taken by satellite and those taken by radiosonde. Further, I found earlier papers by Kuo (1990) and Keeling (1995) that discussed the delay of CO2 after temperature, although neither appeared to notice the even closer correlation of dCO2/dt with temperature. This correlation is noted in my Figures 3 and 4. This subject has generated much discussion among serious scientists, and this discussion continues. Almost no one doubts the dCO2/dt versus LT (and ST) correlation. Some go so far as to say that humankind is not even the primary cause of the current increase in atmospheric CO2 - that it is natural. Others rely on a "material balance argument" to refute this claim - I think these would be in the majority. I am an agnostic on this question, to date. It is interesting to note, however, that the natural seasonal variation in atmospheric CO2 ranges up to ~16ppm in the far North, whereas the annual increase in atmospheric CO2 is only ~2ppm. This reality tends to weaken the "material balance argument". This seasonal 'sawtooth" of CO2 is primarily driven by the Northern Hemisphere landmass, which is much greater in area than that of the Southern Hemisphere. CO2 falls during the NH summer due primarily to land-based photosynthesis, and rises in the late fall, winter and early spring as biomass degrades. It is also interesting to note that the detailed signals we derive from the data show that CO2 lags temperature at all time scales, from the 9 month delay for ~ENSO cycles to the ~~600 year delay inferred in the ice core data for much longer cycles. I compared the hadcrut global temp anomaly to fossil fuel emissions 1850-2014 and found no correlation in the detrended series at the decadal frequency response at which this relationship is supposed to work.